Scooter X Dirt Dog gas scooter has been one of our most popular scooters. 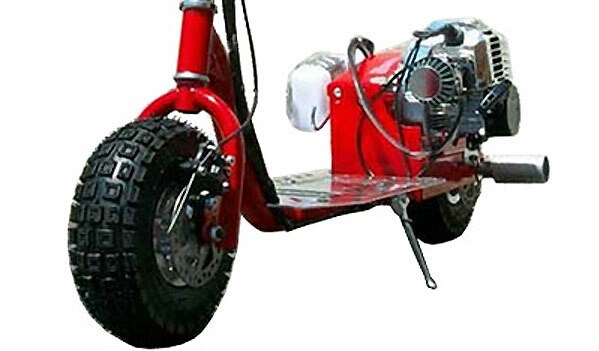 Since 2003 this classic gas scooter has shown it's self to be strong, dependable and ready for fun when you are. With it's all steel frame the Dirt Dog can handle riders up to 250 pounds. That's 5 times it's own weight. Simply Amazing! 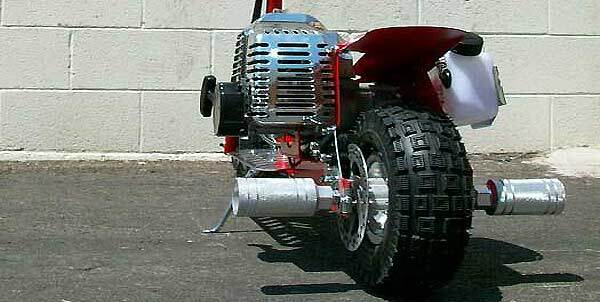 The Dirt Dog Scooter has an automatic clutch. Great for entry level riders. Twist the throttle and away you go. Recommended minimum rider age 12 years. 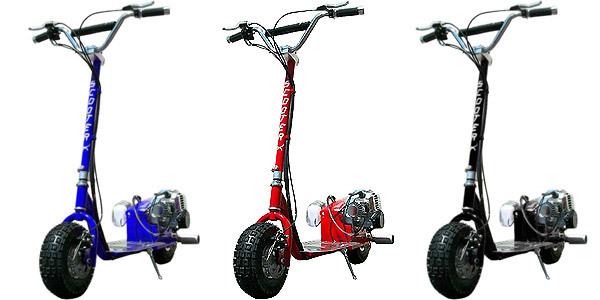 ScooterX Dirt Dog comes in three colors, Black, Red and Blue. Dirt Dog's 49cc two stroke engine will get you up to 28 mph. With available performance parts the Scooter X Dirt Dog gas scooter will get close to 40 mph. Fuel is regular unleaded gas mixed with a small amount of 2 cycle oil. About 4 oz oil to a gallon of gas. Up to 25 miles per tank. (1 liter). Chrome color engine cover. Easy start, dependable Hausheng engine. Recoil (pull) start. Aircraft grade aluminum deck won't rust or corrode. Engine "kill button" is located on handlebars for easy access. Wide 3.5 inch duel purpose tires are 10 inches tall with an aggressive tread design. Equally at home on paved or mild off road surfaces. These robust tires absorb shocks and road hazards better and have a higher resistance to lateral forces. Dirt Dog comes with a set of "stunt pegs" that make doing wheelies a snap. Cast aluminum alloy wheels. Dependable chain drive. Scooter X Dirt Dog has Both front and rear disc brakes. This gas scooter makes an excellent gift for any occasion. Seat: No. This Unit Does Not Come With a Seat. Click the button below to add the Dirt Dog 49cc Gas Scooter by Scooter X to your wish list.